Here we go again with Fishing in the Discount Bin...watching the movies, and blogging about them. This week, I find myself re-watching Disney/Pixar's Cars. That is, I originally watched it and wrote this on July 23, 2017. I'm a total Pixar fanboy, and the trailers for Cars 3 were enough to get me out to the theatre and watch it. Upon coming home, I figured I'd toss Cars in the ol' Blu-Ray player and re-watch the film that launched Pixar's biggest franchise...in terms of merchandise sales. Here's the thing. As maligned as Cars is for being the lesser of Pixar's franchises, the first Cars is not a bad movie. But it's not a great movie. And, at that point in time, we had come to expect great movies from Pixar. And Cars was just...good. I remember trying to put it together as I came out of the theatre after Cars in 2006. Every Pixar film up to that point felt like they were always pushing things a little bit further. A little bit more in terms of storytelling, emotion, animation, everything. Monsters Inc was a little better than Toy Story 2, Finding Nemo was a little better than Monsters Inc, and then when Cars came along, it was like Pixar said, "OK, we got this. We've cracked the code." Cars felt like the first Pixar film where Pixar was content to rest on their laurels. So, yeah. It's good, but not great. Our hero, Lightening McQueen, voiced by Owen Wilson. McQueen is a rookie sensation in the racing world, and is poised to become the first-ever to win the prestigious Piston Cup in his rookie year. 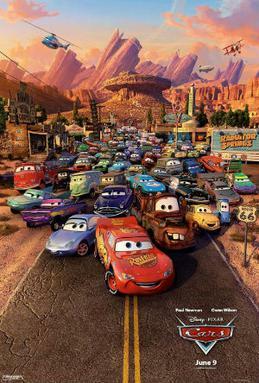 However, the championship race ends in an unprecedented 3-way tie: McQueen, legendary racer Strip "The King" Weathers (voiced by real legendary racer Richard Petty), who's already announced his retirement after this season, and Chick Hicks (voiced by Michael Keaton), the King's long-time rival and perpetual second-place finisher. The officials declare that a special tiebreaker race will be held in one week's time, across the country in LA. Now, McQueen, he's a cocky SOB. He's dedication to the sport and being the best has made him arrogant, driving away pretty much any friend he used to have. He burns through crew members with a speed that rivals what he does on the track. He's embarrassed by his sponsor, Rust-Eze Medicated Bumper Ointment (ha ha, it's hemorrhoid cream in this world), and having to do his contractually-obligated meet-and-greets with rusty old cars. He's hoping that, between the retirement of the King and a Piston Cup win, he can sign with the King's prestigious sponsor Dinoco Oil. McQueen orders his transport, Mack the Truck, to drive 24/7 to get him to LA first, so he can spend an extra week wining and dining the Dinoco execs. A sleepy Mack accidentally dumps off McQueen in the middle of nowhere. A panicked McQueen wakes up, and winds up literally tearing up main street of the small town of Radiator Springs. The small town judge and doctor, Doc Hudson, is eager to clear McQueen of the charges and get him the hell out of town. But, the small town lawyer, Sally, implores Doc Hudson to sentence McQueen to community service and fix up main street, because hey, main street needed it anyways. Thanks to an inspirational speech Sally gives the residents, Doc Hudson sides with Sally, and McQueen is ordered to tow the town's paving machine down main street until main street is fixed. And thus begins our main plot thrust. Stuck in this small town, patching up the road, McQueen comes to befriend the citizens of Radiator Springs, slow down, appreciate life, and stop being so selfish. And this is where the whole "resting on its laurels" comes into play, The whole thing does seem rather Dreamworks-like, in the way the town of Radiator Springs is populated with celebrities doing their schtick. George Carlin is a little bit wasted as Fillmore, a VW bus hippie. Cheech Marin fares a little bit better as Ramon, a low-rider and body art specialist, who can give you a new paint job for any occasion. The main scene-stealer is Tony Shaloub as Luigi, the Italian tire shop owner, and his sidekick Guido, who dream of selling tires to a Ferrari someday. But the most infamous one is Mater the Tow Truck, voiced by Larry the Cable Guy, pretty much just doing his stand-up schtick...you know, the simple, redneck stereotype. And, as we learn in Cars 2, Mater is best in small doses. Here, he's tolerable as he declares McQueen his new best friend and starts worming his way into McQueen's heart. In fact, Mater perfectly represents a web comic I saw going around about how to make friends as an adult: just find someone you like, and hang around them until they finally accept you. The one that deserves to be remembered, though, is Doc Hudson, voiced by Paul Newman, in what wound up being his final film role. Doc Hudson is a lovable old grump who takes an instant dislike to McQueen, and McQueen eventually finds out why. Turns out Doc Hudson is the Fabulous Hudson Hornet, a legendary racer in the 1950s. After a career-ending accident, Doc Hudson felt like the racing world turned his back on him, so he turned his back on racing and pretty much hid in this small town. Their relationship turns out to be mutually beneficial, as Doc teaches McQueen the old sports adage of winning and losing not mattering, and McQueen helps Doc get his racing mojo back. And the other standout is Sally, our lawyer, voiced by Pixar regular Bonnie Hunt. I'd almost like to see a prequel about her story. When McQueen starts asking her how she got stuck in Radiator Springs, she tells her story about how she was a big city lawyer in LA, but she found her work unfulfilling. So, one day, she just drove away from it. She drove and drove and drove until she couldn't drive anymore, and found herself in Radiator Springs -- both literally and figuratively. She fell in love with the town and its residents and decided to settle down there, where she runs the motel and optimistically tries to return the town to its former glory. Looking through the DVD bonus materials, can't help but wonder if director John Lasseter based Sally on himself a little bit. The DVD bonus materials elaborate that the original inception for Cars was to be about a lone electric car in a world of gas-guzzlers. But, in the year 2000, fearing that he was starting to become to obsessed with work, Lasseter took an extended vacation. Being a bit of a car enthusiast, he loaded up his family in an RV and they went on a road trip down the historic Route 66. After that, the entire movie changed to be about a town along Route 66, and how it died once the Interstate was built. Based on the featurette, and the footage Pixar shot along Route 66 and the Route 66 historians they talked to, I would still love to see the Pixar-produced Route 66 documentary compiled from their footage and interviews. And here we go back to what I mentioned before about resting on their laurels. We're treated to a montage set to a James Taylor song showcasing Radiator Springs in its heyday, and how it withered and died after the Interstate came through. No doubt Lasseter was hoping for an emotional gut punch, like Jessie's song in Toy Story 2, or the opening sequence of Up, but the whole thing just kind of rings hollow. Anyway, the entire racing world is gobsmacked by the mysterious disappearance of Lightening McQueen. As McQueen's presence is stirring up too many unpleasant memories of his past, Doc Hudson eventually tips off the media as to where McQueen is, and the racing world literally comes to Radiator Springs and drags McQueen away. It's the day of the big race, and McQueen can't get his head in the game as he's growing homesick for Radiator Springs. But...surprise! As McQueen has successfully softened Doc Hudson's heart, Doc Hudson shows up, wearing his old Fabulous Hudson Hornet colours, takes the role of McQueen's new crew chief, and the denizens of Radiator Springs form McQueen's new pit crew. With Doc's coaching, McQueen's victory seems assured. But, not wanting to lose to the King one last time, Chick Hicks pulls off a dirty move, and the King is in a horrible wreck. Upon seeing this, and remembering what happened to Doc all those years ago, McQueen stops mere feet from the finish line, allowing Chick Hicks to win. McQueen turns around, and helps the King across the finish line, explaining that it's only fitting the King get to finish his final race. For this display of sportsmanship -- and to borrow the line from Rocky -- Chick Hicks won the race, but McQueen won the day. As Radiator Springs taught him loyalty, McQueen turns down the Dinoco sponsorship, instead sticking with Rust-Eze, as they gave him his big break. And to help revitalize Radiator Springs, McQueen announces that he's establishing his new racing HQ in Radiator Springs. Happy endings all around! Like I said, it's good but not great. The plot is formulaic. But the animation is mind-blowing. Pixar gets damn near photo-realistic as they create the vast vista and beautiful roadside scenery. The soundtrack is pretty good. Randy Newman does a pretty solid score, and most of the pop songs on the soundtrack are pretty good. Hell, working at a country music station in Canada, we still give that Rascal Flatts cover of Life is a Highway a lot of airplay. And there we have Cars. While it's not Pixar's best, it's not a bad little film, all in all.